Site of the US Mens Clay Court Championships. With close to two dozen outdoor subsurface clay courts and topping it off with an outdoor stadium, this complex is just one example of the quality of our workmanship and the durability of our company as the sub contractor for this project. 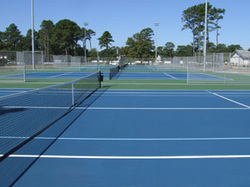 Empie Park is an 18 all weather court tennis park funded by the city of Wilmington, NC. This new facility is a state-of-the art tennis complex with plans for a future stadium court and five additional clay courts. Conversion project from hard surface to subsurface clay, we worked within the existing fencing and lights to accomplish a seamless look as the sub contractor for this project.